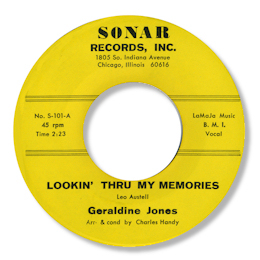 Chicago singer Geraldine Jones only had a small number of 45s all of which were of good quality but like so many other talented individuals she was unable to nail that big hit. Her first sessions were held by local record man Leo Austell who put out her first release on his tiny Sta-Set label. This coupled the uptempo tough soul of “Baby I’m Leaving You” with a really fine ballad. 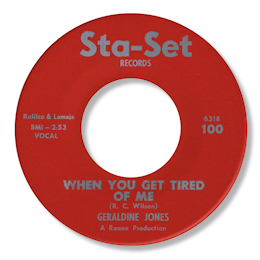 When You Get Tired Of You showed off Geraldine’s strong confident tone to very good effect, backed by a fine arrangement – love those muted trumpets. That this fine double sided disc was picked up by Juggy Murray in New York comes as no surprise at all. Jones’ second release was for Austell's even smaller label Sonar however so sales of the first can’t have been that good sadly. The melodic beat ballad “I’m Crackin’ Up” was another goodie and the flip Lookin’ Thru My Memories a fine doo wop styled ballad. A purist like me might say the obtrusive background singers prevent this one from getting five star status – but it is a worthy effort nonetheless. Her third 45 came a few years later yet again on a tiny label Herb-Art. The top side of this "Spoil Me", written by Windy City veteran Eddie Silvers, was one of those chugging, brass laden numbers that so typified the city's soul music. This too featured a strong confident vocal but it must have got lost amidst all the other releases of the time. UPDATE ~ Bokso Asanovic has written with details of Geraldine's Renee 45 - I'm always grateful to Bosko for his knowledge. Thanks to my friend John Broven for the suggestion.